Top-shelf, limited edition bourbons and barware beckon at the Lewis & Louis shop. Bishop & Young dress, $89, from The Urban Farmgirls; Pixie Mood purse, $48, from Six Sisters; Forme headpiece, $450, from Forme Millinery in Mellwood Art & Entertainment Center. You and your out-of-town guests don’t need a room to enjoy amenities like the Library Bar, bowling alley or the Urban Food Hall. On Alex, left: Bishop & Young dress, $115, at the Urban Farmgirls. Lilana shoes, $29.95 from Pix Shoes. Fascinator, $250, from The Hat Girls in Norton Commons. On Maria: Black Halo dress, $374, at Liv Boutique. Carmen Marc Valvo shoes, $69.95, from Pix Shoes. Fascinator, $250, from The Hat Girls. These escalators will carry countless women in gowns to galas in the stunning ballroom on the mezzanine. When will you be there? Soft light, scented candles and soothing saunas will revive your spirits; oxygen facials will refresh your complexion. 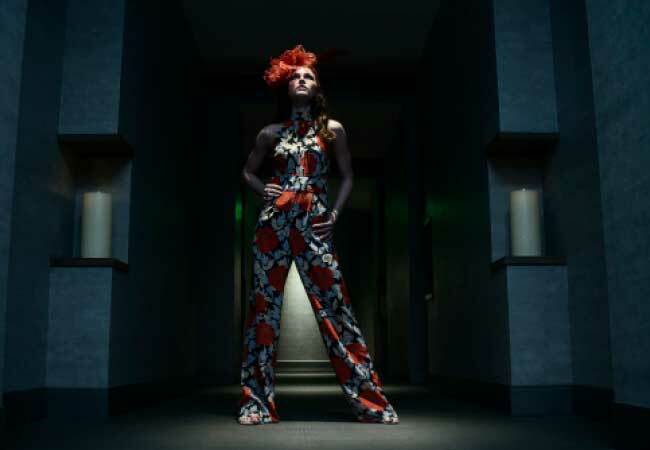 On Maria: DVF jumpsuit, $468, at Rodeo Drive; Headcandi fascinator, $344, at house of k boutique. Sprawling, curtained booths at Pin + Proof provide a perfect landing place post-track. On Alex, left: Milly dress, $78, from Sassy Fox; Summer Eliason necklace, $198, from Summer Eliason Designs; Hat, $520, at Hat Girls in Norton Commons. On Maria: C Christian jumpsuit, $88, from Six Sisters Boutique; Forme Hat, $660, from Forme Millinery in Mellwood Art & Entertainment Center. The relaxation room in the sybaritic 20,000-square-foot Mokara Spa is the ideal recovery plan for a week at Churchill. Just sip infused water, exhale and wait for your massage. FYI: Spa treatments come with free rooftop pool and bar access. Go to omnihotels.com/hotels/louisville/spa/packages for more information. On Alex: Dress Forum maxi dress, $89, and earrings, $10, from Apricot Lane in Westport Village; Headcandi fascinator, $328, at house of k boutique. Stunning vantage points all over this 360 million dollar, world-class hotel offer a new perspective on the city you call home. 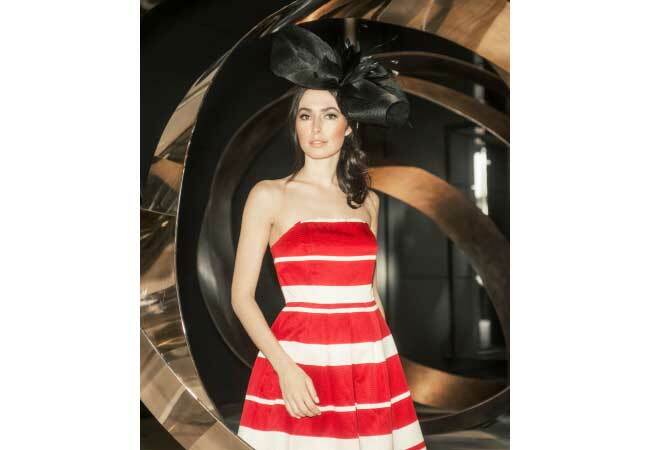 Alice McCall dress, $430, at Rodeo Drive; Forme cocktail hat, $475, at Forme Millinery in Mellwood Art & Entertainment Center. The Omni Lobby is also a showplace for artwork, like this modern art installation. Over 21 curated local paintings, drawings and mixed media works are on display and for sale. Bowling anyone? Yes please, at the posh Pin + Proof speakeasy, where a bar, small plates and plush booths promise after-hours adventures. C Christian jumpsuit, $88, at Six Sisters Boutique in NuLu; Summer Eliason ring, $265, at Summer Eliason Designs on Frankfort Ave; Forme hat, $660, at Forme Millinery in Mellwood Art & Entertainment Center. 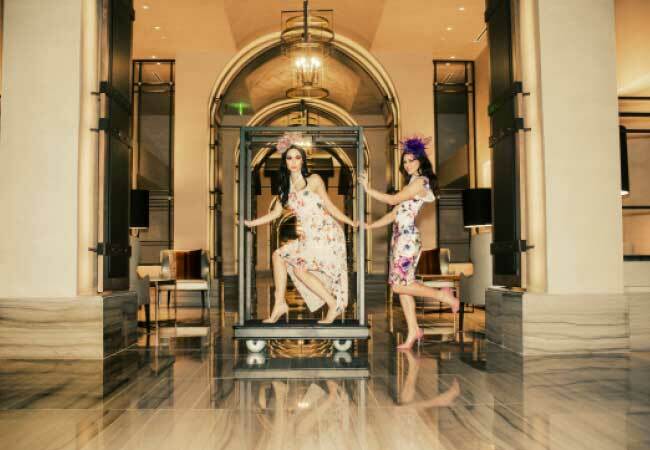 Our city’s new playground, the Omni Louisville Hotel, is certain to bring fresh energy and excitement to the global party that is The Kentucky Derby. 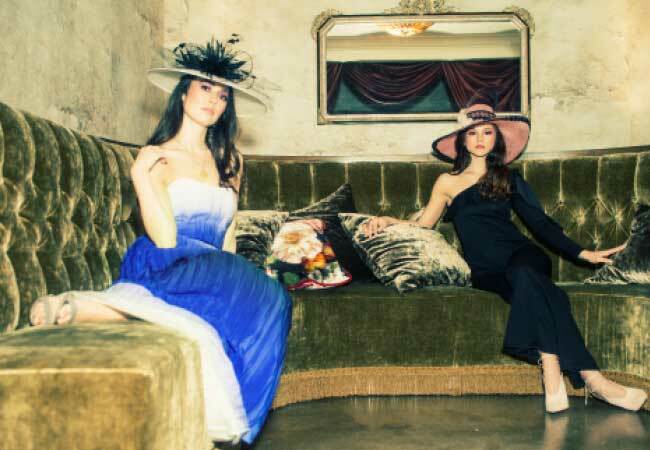 To demonstrate, we took two models downtown to explore the parameters of imaginary pre- and post-Derby experiences. Let their escapades and ensembles inspire your own. Styled by Christine Fellingham and Samantha Coburn. Hair and makeup by Jessie Coleman and Carla Howard. Models Alex Hendrickson and Maria Bohn for Heyman Talent.